Remember the men and women who have died in military service for the U.S. with patriotic Memorial Day crafts, including memorial day crafts for kids. Sure, these patriotic crafts are perfect for decorating for a Memorial Day BBQ, but they also demonstrate a level of appreciation for our fallen soldiers and a collective pride for our country. With the help of this article, share Memorial Day trivia with family and friends and answers to the questions, "why do we celebrate Memorial Day?" and, "When did Memorial Day become a national holiday?" The story of Memorial Day is an inspiring tale that everyone should hear. Don't forget to observe the National Moment of Rememberance at 3 p.m. on Memorial Day with a moment of silence or your own personal observation. It's time to get patriotic and show off your love for the red, white, and blue with these 13 American Flag Decor Crafts. If you're looking for Memorial Day craft ideas, you can't go wrong when you evoke the American flag. Best of all, these crafts are appropriate for a variety of age groups and skill levels. Memorial Day, also known as Decoration Day, was created after the American Civil War to honor soldiers who had died in the war. Waterloo, New York was the first town to officially observe Memorial Day, celebrating it first on May 5, 1866 and each year thereafter. General John A. Logan, the commander in chief of the veteran’s organization Grand Army of the Republic, issued a proclamation on May 5, 1868 that “Declaration Day” be observed as a national day, so the first Declaration Day was observed on May 30, 1868 nationwide. This date was importantly not the anniversary of a battle. The name “Memorial Day” was not used until 1882, and was not declared the official holiday name until 1967. The date was moved from traditional May 30th date to last Monday in May in 1971 to ensure a convenient three-day weekend. After World War I, Memorial Day was expanded to commemorate all U.S. men and women who have died in any war or military action. Memorial Day is a way to remember their great service to the country. Many police and fire department also honor men and women who have died in service on Memorial Day. Memorial services are held for fallen soldiers at churches and community centers, graves are visited and decorated with flowers and many towns hold parades. Volunteers place American flags at each gravesite at the National Cemeteries. A national moment of remembrance is held at 3 p.m. Eastern time. On Memorial Day, the American flag should be flown at half-staff until noon and then raised to the top. Red Poppies are the official flower of Memorial Day. Many states in the South refused to observe Decoration Day, as Memorial Day was then called, until after World War I when the meaning of the holiday changed to include all wars or military action. New York was the first states to officially recognize Memorial Day. Taps is often played on a trumpet in Memorial Day ceremonies. The Fourth of July is quite possibly the best day of the year - it's warm, sunny and filled with patriotic pride. Change the way you think about Fourth of July crafts (and Memorial Day crafts for that matter) and create patriotic crafts all year long. Let 48 Fun 4th of July Decorating Ideas serve as inspiration for your Memorial Day crafts, patriotic projects and American flag ideas. Honor veterans and show off your respect for the country - it's a great way to evoke Independence Day all year long. Safety Pin American Flags: Kids and adults alike can create the perfect Memorial Day crafts with nothing more than safety pins and red, white and blue beads. Here’s how to create these patriotic flags. 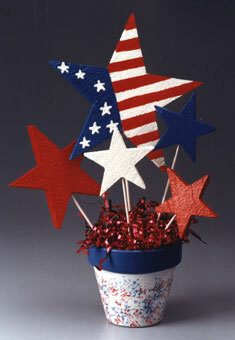 Patriotic Starburst Bouquet: Kids can help paint and assemble these easy patriotic bouquets. These are great table centerpieces for a Memorial Day gathering. Red, White and Blue BBQ Skewers: The perfect item for a Memorial Day cookout, kids can help paint wooden spools for these patriotic skewers. 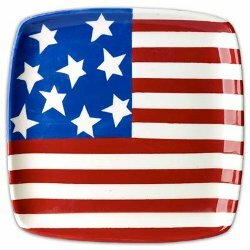 American Flag Plate: Kids will love the Memorial Day craft and will want you to use it at your next barbecue. Americana Button Earrings: Who says you can't make big things out of small items? Dig into your button stash and create delightful Memorial Day crafts. Create meaningful Memorial Day crafts that will make you feel good on the inside. 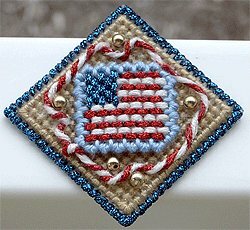 There are so many ways to create your own version of an American flag, so use your skills and make something unique. Memorial Day craft ideas aren't as popular as Fourth of July crafts, but that doesn't mean you should make something that really makes a statement and shows how much you care. 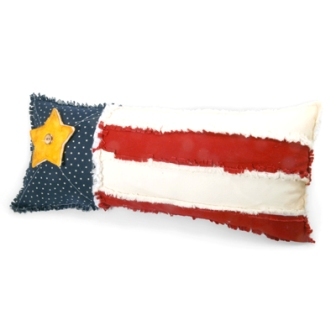 Whether you wear the flag around your neck, create a wreath or design a pillow, you'll have a great time creating your own Memorial Day crafts.